USUALLY at the annual Academy Awards, the major excitement and bragging rights on the night await the naming of the best movie, the best director and the leading actor and actress. Last Sunday night in Monaco, Irish rugby scooped all the main Oscars at the World Rugby Awards. Ireland not only took away the best team of the year, but also the best coach, Joe Schmidt, and the player of the year Johnny Sexton. It was at least a little payback for the unfortunate Brian O’Driscoll who really should have walked this award in 2009. For the first time in years, it broke a virtual stranglehold by the All Blacks and it just shows how far Irish rugby has come in recent years. In a year where Schmidt guided Ireland to the country’s third Grand Slam win in its history, plus a monumental series win in Australia, it seemed hard to top that until Schmidt led Ireland to a first ever win against the All Blacks on home soil. The mark of any great coach is to leave a team in a better place than when you found it and whatever happens in Japan next year, Schmidt will leave behind boots that are almost impossible to fill. Back-to-back European Cups with Leinster, wins in South Africa and Australia with Ireland, two victories over the All Blacks, a Grand Slam and two more Six Nations Championships fill a pretty big CV. Schmidt has not left his able replacement Andy Farrell with too many leftovers. A series win on New Zealand soil, more Grand Slams and, depending on what happens in the next World Cup, maybe that as well, although who would not bet on Schmidt hovering that up as well? 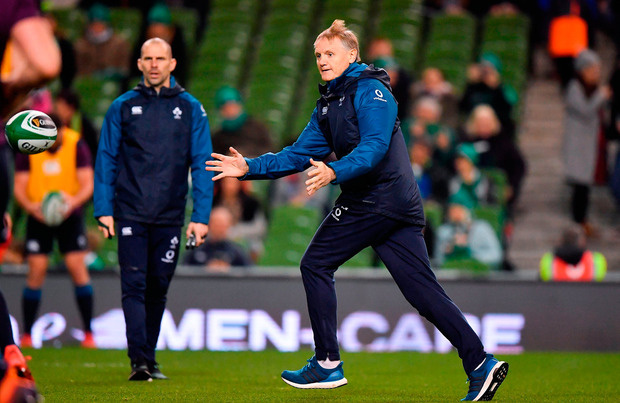 In my opinion, Schmidt not only leaves behind a tactical coaching blueprint for the future but, more importantly, also a cultural change in the game in Ireland. Years ago when Schmidt arrived to these shores, he told the Leinster players that they may not be big enough to compete against what the French teams were building at that stage. To win, he would make them the best passing side in the Heineken Cup; that the speed of the pass would always best the player. Some of the more experienced players probably thought they were motoring along pretty well thank you. However, they would soon learn in a complimentary way that it was ‘Joe’s way or the highway’. There were rumours of skill sessions passing with an egg, so that the Leinster players could develop softer hands. But change took time and at that stage and maybe in a different province Schmidt may not have even survived, as coaching can so often be judged purely on results, not vision. Schmidt even lost the first few games at Leinster and had his detractors but that was before they went on an upward trajectory that conquered Europe. However, it was more than on the field of play that Schmidt changed things; it was a culture of respect and camaraderie that he brought. Joe Schmidt made all the Leinster players shake hands with each other before training; he does the same with Ireland I believe. That the players are grateful for what they have, he asked, not forced them, to respect everyone in the game from the bag man to the top executives. He said that he always greeted his own children that way, with a handshake and a smile, it was a respectful and humbling touch. Schmidt carried that same philosophy into Ireland along with it a culture of hard work, learning and respect. It is said that one year Schmidt brought his players to a homeless shelter over Christmas, where they worked for a few hours serving food and enjoying the company of those far less fortunate, it was never written about simply because it was never meant to be a PR exercise. It was the coach’s way of saying that life is good, appreciate where you are and what you have, earn it. In a nutshell, a holistic look at rugby, that a better person makes a better player. Schmidt promotes an environment of continuous learning and an ethos of being humble in all aspects of your life. None of his players are outspoken or controversial. To me, that is changing a culture from the top down. He is a lesson in positive management skills – that you can be tough and ambitious but if you believe that at your core that rugby is still just a game and other things in life are more important, then you will always win, even if you lose on the scoreboard. Even Schmidt’s departure was classy, as was his almost seamless handing over to a man he has praised on numerous occasions – ex-English rugby union and league star Farrell. Schmidt did not want any major fanfare. He obviously thought long and hard about his life away from rugby and in some ways, his decision was about the very culture he created with Irish rugby, that his family was more important. The break-up was even easier when he announced that he would be taking a rugby hiatus, thereby not going straight into the New Zealand job. That scenario may have been hard for many to swallow, even though you can see him getting that job one day. For now, he felt that he needed an amicable separation – again classy and respectful to all involved both in Ireland and New Zealand. Irish rugby will continue to prosper and, like any team, will have its great and its off days but Schmidt can leave his post with immense pride, safe in the knowledge that he has achieved what he always set out to do from the onset, to leave a team, and more significantly a sporting culture, in a better place. That was all he or anyone could have asked for.